I like bright cheerful colors. D claims the first time I got to paint a house I channeled my secret love of hamburgers. 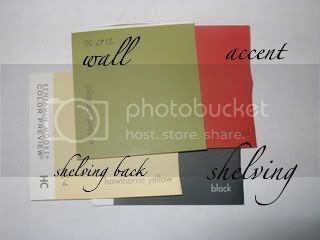 The walls were "ketchup red," "lettuce green" and "mustard yellow" with "hamburger brown" wood floors. I think D is color blind. They were definitely not those colors. Not even close! Today, my sister and I hit the paint store. Sissie's husband just transferred to the town I live in. She might make an occasional appearance on the blog. Anywho, Sissie and I both like to paint. She also likes colors...just a different palette than me. The first person to help us pick colors at the store was a man. He doesn't speak woman so when I said "fun, funky" he stared at me blankly. He put together a palette and I just didn't LURVE it. So I sought help from a woman who promptly told me my color choices were juvenile and it was her job to help me select a grown up "fun and funky" color scheme for the house. And I am really happy with what she chose when I explained what I was looking for. I'd love to hear opinions on this :) The red accents are in the appliances that I already own: microwave and blender. And for the living room, I really wanted yellow. Apparently, people are afraid of yellow. Yellow makes me happy. So yay or nay? I'd love to hear opinions :) Do you love color? Yellow? Green? Or are you a neutrals kind of person? I also love color and I think those colors are wonderful and very grown up! My bedroom is that same shade of yellow - called Saffron - and I love it. We currently have a green living room and kitchen and it's fresh and cozy. Enjoy your new project! I have never regretted a day that we put vibrant colors on the walls. 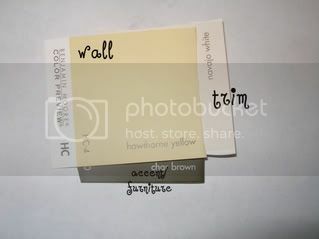 I have, however, regretted every day of "eggshell" or white on previous walls. Be brave and go for color! i love your colors--i have many colors in my home, i love so much i hope they stay looking good for years! Shannon: You would be correct :) We are going to have a few other black accents but nothing major. I love the yellow! I love color! Well, you know, you've seen all of the blue/yellow/green/pink at my house.